Longtime readers here may recall that yours truly and others have written about liberties New York Times reporter Kate Zernike has taken with the truth, especially in her reporting on the Tea Party movement. Her penchant for inventing baseless stories about alleged racism in the movement once caused the late Andrew Breitbart to label her "a despicable human being." Breitbart might well have the same reaction to the hours-later revision made at Zernike's Times story Friday about Chris Christie. 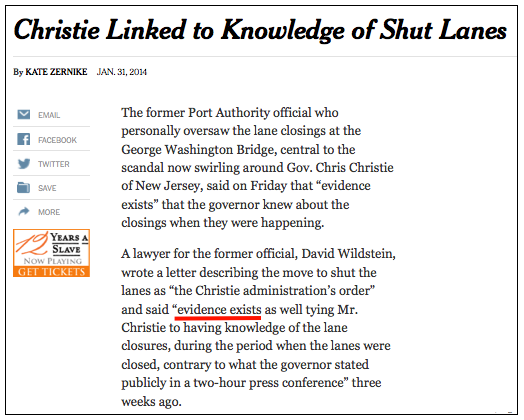 Several alert bloggers and tweeters noted that her story about Christie's knowledge of shut lanes on the George Washington Bridge conveniently went from solid to speculative without any indication that any changes had been made. Kate Zernike is smart enough to know that there's a world of difference between "he has evidence" and "(apparently unpossessed and unseen) evidence exists." So why did she run with "he has evidence" for at least several hours? And why doesn't she and/or the Times have the integrity to tell us about the change? 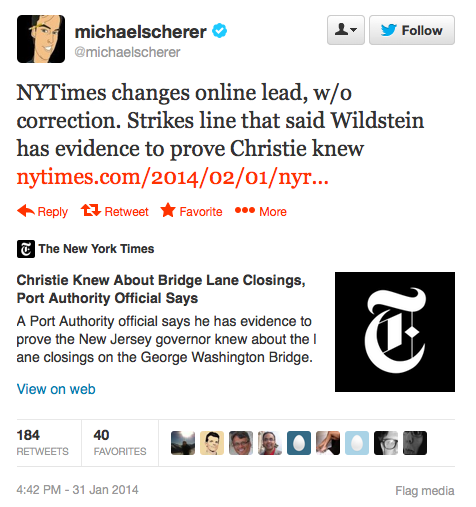 The "correction" added sometime this morning appears to be unrelated to the nature of the "evidence." "Clumsy"? How about "misleading, and likely deliberately so"? 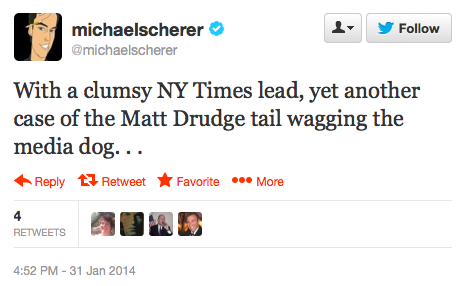 Drudge didn't wrote the story, Michael. If Drudge made a mistake, perhaps it was in trusting anything originating with Kate Zernike in the first place. Perhaps Zernike knew that a deliberately exaggerated story on a Friday afternoon might cause Drudge to bite, and would plant the impression in the minds of many that Christie has been caught dead to rights. Though he may ultimately be, the Times walkback indicates that it hasn't happened yet. But Zernike and the Times have "successfully" made that impression widespread. Mission accomplished, I suppose — if your goal is to deceive and destroy regardless of merit.